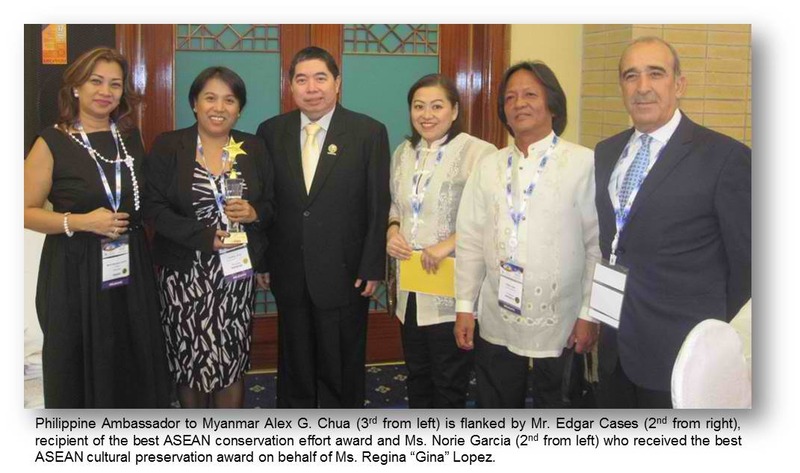 30 January 2015 The ASEAN Tourism Association (ASEANTA) presented the best ASEAN conservation effort award to Mr. Edgar Cases, managing director of Project Sharklink, a non-profit organization, and the best ASEAN cultural preservation effort award to Ms. Regina “Gina” Lopez, managing director of ABS-CBN Foundation, Inc., at the opening ceremony of the recently concluded ASEAN Tourism Forum (ATF) held in Nay Pyi Taw, Myanmar from January 22 to 29. ASEANTA’s best conservation effort award recognizes Mr. Cases’ efforts, through the Project Sharklink, to protect Malapascua Island’s thresher sharks. Besides Mr. Cases, Ms. Gina Lopez also received the best ASEAN cultural preservation effort award which recognizes her active involvement, through the Green Initiative of the ABS-CBN Foundation’s Bantay Kalikasan, in the development of the village museum in Lamlifew, Datal Tampal in Malungon, Saranggani as a sustainable eco-tourism destination. The Green Initiative, a collaborative effort between the ABS-CBN Foundation, Department of Tourism (DOT), Department of Agriculture (DA), Department of Environment and Natural Resources (DENR), and Ateneo de Manila University aims to preserve biodiversity and eradicate poverty in 11 selected sites throughout the country. In Lamlifew, Saranggani, the Green Initiative assists the local government in developing the village into a sustainable eco-tourism destination that preserves the culture and traditions of the B’laan tribe and provides sustainable livelihood to the community. The ASEANTA Awards for Excellence recognizes individuals and organizations with positive contribution to the development of tourism in ASEAN. Copied from DFA's news post.